When framing images something that is often given very little thought to by photographers is the type of glazing used. But the glazing used will make a massive difference to the final image, including the colours of the print. The most popular glass used in picture frames is ordinary float glass. It’s cheap to buy and in my opinion looks a million times better than plastic / acrylic glazing. Like any product though, the quality varies depending on the manufactures. When it comes to printing even if you have spent a lot of time soft proofing your images to get the colours perfect, you can be in a for a little surprise once it’s framed. This is because normal float glass and plastic Acrylic glazing will introduce a colour cast to the mount and print. Normal float glass contains impurities due to the iron contained in the glass. These impurities then introduce a slight green tinge to the image and to the mount used and dull the colours down slightly. A great alternative to ordinary float glass is Waterwhite float glass. It doesn’t cost much more than standard float glass either. Waterwhite glass has a lot of the impurities removed, so no colour casts. It also offers better light transmissions giving a cleaner and clearer image. Anti reflective glass is my personal favourite glazing to use, also sometimes referred to as invisible glass. Conventional picture framing glass typically reflects 8% of incoming light, distracting the viewer with mirror-like reflections. With antireflective artglass, light reflection is as low as 0.5% thus offering 16 times less reflection and eliminating any mirror-like effects. Products such as Artglass AR provides 99% light transmission, making it practically invisible so all the viewer sees is pure art. The anti reflective Artglass I use is also a waterwhite glass, so no colour tinges and no reflections. This gives excellent clarity and really makes the artwork pop. Due to the technology and manufacturing process there is a considerable jump in costs with the artglass, (almost ten times the cost of standard float glass) so it usually adds a fair bit to the cost of a frame. This image shows three pieces of glass, to the left is standard float glass, in the middle is Clarity Anti Reflective Glass and to the right is diffused glass. 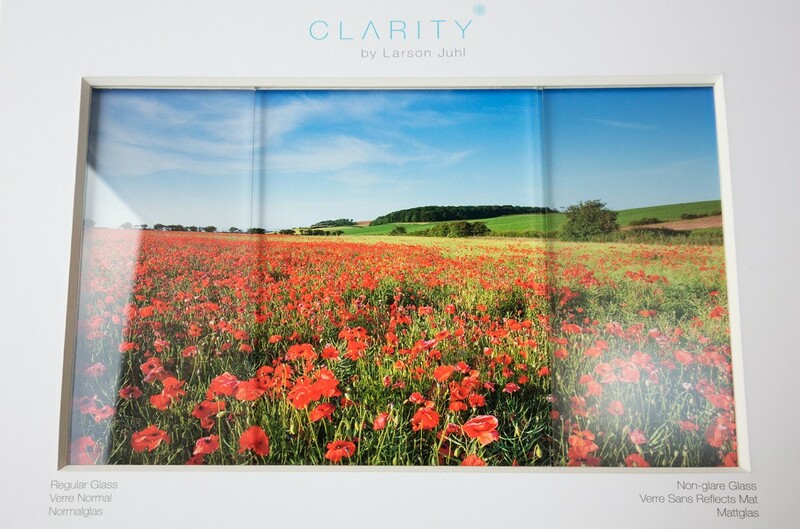 With the image above notice how the anti reflective glass brings cleaner and crisper colours to the image. One type of glazing that is often confused with antireflective glass is antiglare glass or diffused glass; some people also refer to this glazing as anti-reflective which doesn’t help matters. This is a cheaper glazing where the reflections are reduced because the glass is etched. This also affects how clear you see the image so the picture also becomes diffused. In my opinion just stay well clear of this, it’s not a good look and if the product is going into a room where reflections are a problem then it’s worth spending that little bit extra and going with the antireflective glass. 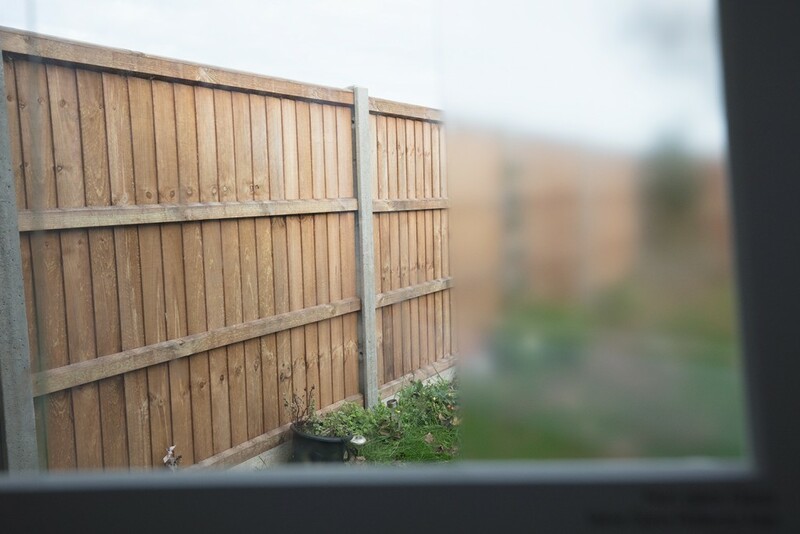 The image below shows how the sharpness of the image is also affected by the glass. With diffused glazing the image has to be very close to the image for it to work so extra thick mounts don’t work quite so well. The image below shows how diffused glass works. Where safety is a concern plastic glazing can be used. Styrene is the cheapest plastic option, however it is cheap looking, nasty and extremely easy to scratch. Next up is Acrylic, which is more durable, there are lots of price options here including standard, cast, anti reflective, UV and scratch resistant. Although I do occasionally use Acrylic glazing, in my opinion it does not look nowhere near as good as real glass unless you are prepared to pay a lot for it. The price of plastic glazing starts at under £10 a sheet to well over a £1000 a sheet for products such Truvue Optium. One of the major downsides to plastic glazing is it’s also very easy to scratch so it’s worth going for a scratch resistant type. For those of you who are not that familiar with myself my time is split 50 / 50 between being a landscape photographer and a printer and framer doing work for other artists and photographers elsewhere my website for this www.Photographyprinting.co.uk. 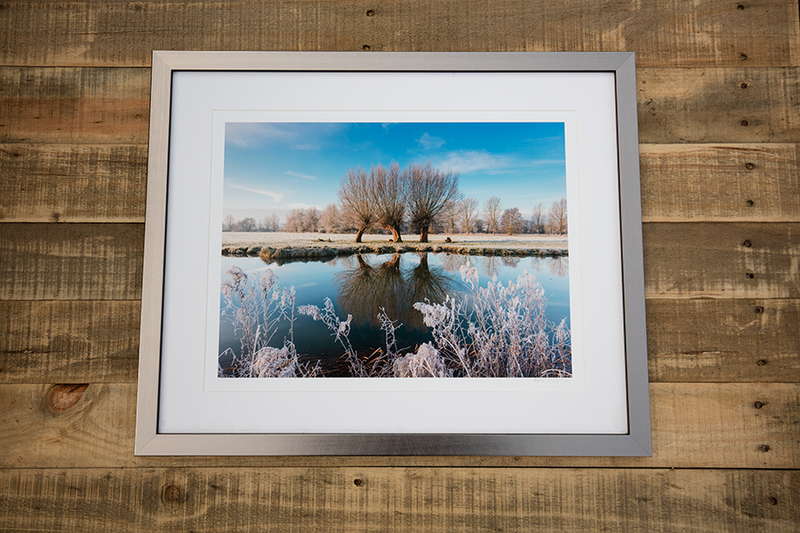 One thing I did with my own framed landscape photography images a couple of years ago is I put my prices up at the galleries I was supplying and changed to offering my framed products exclusively in anti reflective glass. I wasn’t sure if people would be prepared to pay the extra for it, but Instantly it was a massive success, suddenly I was selling more each month than I was doing in three months and it has continued that way ever since. It also helps having work displayed next to other images without anti reflective glass so people can see the difference with and without and then decide if they are prepared to spend the extra.